WARNING: Readers may find the video disturbing. A passenger on a flight from Mexico to the United States has been detained after he opened a cabin door as the plane was taxiing to the runway. Frontier Airlines' Flight 87 was bound for St. Louis, Miss. from Cancun on Monday when he claimed he was “feeling ill and became agitated,” an emailed statement from the airline to CTVNews.ca said. The decision was made to return to the gate, the statement said. As the plane was taxiing the man became “physically violent” with a flight attendant and opened a cabin door, which automatically deployed the emergency slide, the airline said. Kathleen Ingham, a passenger on the flight, said the man went to the front of the aircraft and started “kicking the cockpit door” and asking to be let off the plane after they left the gate. She said he then pushed a flight attendant and opened a cabin door, which automatically deployed an emergency slide. “Thank God for the brave men and women that held him in the plane or he for sure would have been sucked into the engine,” Ingham wrote in a Facebook post. 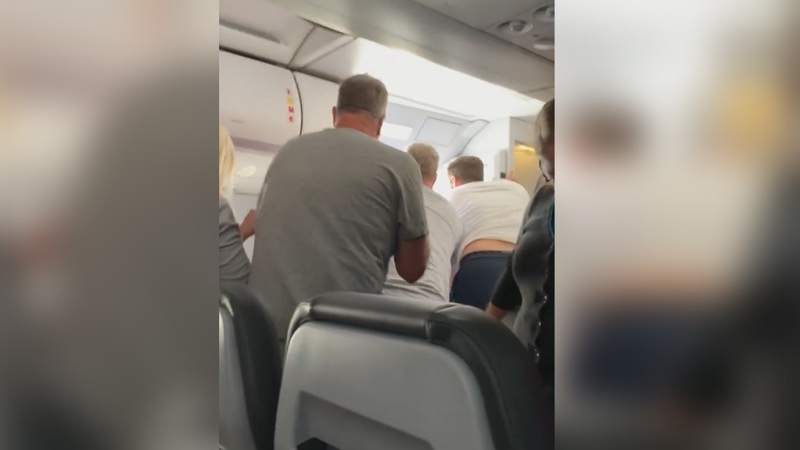 In cellphone videos Ingham shared, a group of people can be seen huddled at the front of the plane struggling with the man who opened the door. “The people on the plane literally made a human chain to keep him from falling out of the plane,” Ingham said in a Facebook comment on her post. Frontier Airlines said crew members, assisted by other passengers, restrained the man until authorities arrived. Ingham said the man was escorted off the plane by police. In one of the videos, the man was seen being comforted by another man believed to be his father. 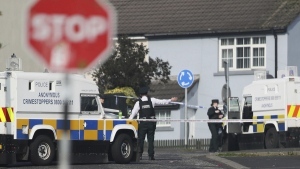 The man was taken to hospital for medical evaluation following the incident, the airline said. The other passengers on the flight were given accommodations and rebooked on other flights. Ingham called the incident “insanely scary” and said she and her friend were booked on a flight scheduled for the following day. “We're just so grateful for the bravery of the airline crew and all the brave passengers that jumped in to help make a chain holding on to one another to try and pull this man back into the plane,” she wrote. Added my description to this post as a picture as these videos have been taken down more then once and my description deleted.